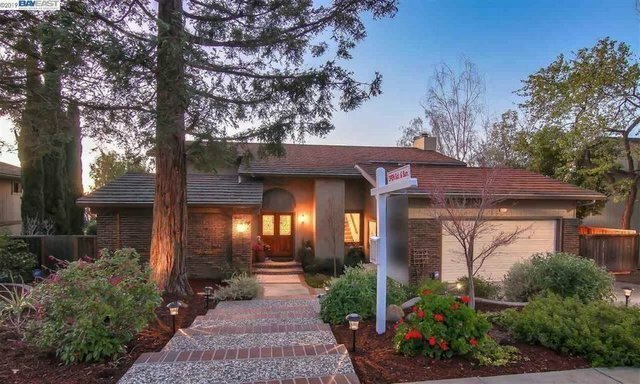 Custom and beautifully updated 4 bed/2.5 bath Weibel home - situated in the picturesque rolling hills of one of the most beautiful neighborhoods of Fremont, boasting timeless architecture enhanced by a modern California feel. This home offers an elegant grand entry, gourmet kitchen with granite slab counters, tile accents, center island, butlers pantry, and hand crafted cherry wood cabinets. This home also offers hardwood flooring, vaulted ceilings, family room w/ a large fireplace, custom wood mantle, bar area w/ built in wine cooler, recessed & pendant lighting, A/C, custom window coverings, and remodeled bathrooms w/ designer sinks & light fixtures - including other ample designer touches throughout. Pella French doors in the family room will lead you into the ultimate backyard for entertaining - offering a professionally landscaped front/back yards, custom redwood decking w/ built-in benches, including bay views and hillside views. Close to 680/880, BART, shopping and so much more.